Description: Brand new 2008 at the Worcester engine house. Boy, she never looked so good! 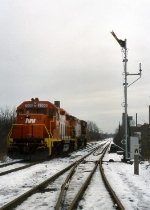 Description: PL-1 waits on the old N&W for Amtk 168 to clear, before heading east on the Shore Line to Midway. Description: PL-1 arriving at Midway. Description: Pair of GP-38's at the engine house in Worcester, shot during a pause in the NHRHTA's Yankee Clipper fan trip, part of which is seen at left. Description: In the lead n/b approaching Laurel Hill Tunnel on the Providence & Worcester Railroad Norwich Branch. Color print scan. Description: On the Providence & Worcester Railroad Norwich Branch. 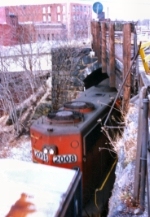 Entering Laurel Hill Tunnel n/b at Norwich, CT. Color print scan. Description: Well lots has changed in this scene! The 2008 and 2201 are now in the new scheme. The parking lot has been paved and there's a garage in front of the antenna for the night crew to park their cars. The tracks by the office are different also. The barn has been moved to about where Im standing, and Peoples Coal is gone. Description: The power off of PR-3 done for the day. Description: Power off of PR-3 heading into the enginehouse to warm up. They'll probably work on PRWO later in the evening. Description: the 2008 next to the Valley Falls Operations Center. Description: Part of the power for PRWO. They just started up in the enginehouse and are now pulling out to make up their train. Description: This mornings power, June 24th for PR2 - the 2008 and 2009. that's the 2007 from PR3 pulling away. The crew will probably Y one of these when they do the Moshassuck Valley this afternoon. Description: PW 2008 on the rear of PR-2, reversing roles of leading locomotive with the 2009. Description: PW 2008 leading the way to CCL. Description: Back home in Valley Falls after its jaunt to West Springfield, Massachusetts last Friday. 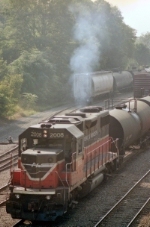 One of the GE's died and they used the 2008 as the lead locomotive. PR2 will use these locomotives today. Description: Some railroad humor! I understand there was a mallard duck going for a ride also! Description: Broadside shot of the 2008 leading PR-2 up the East Providence Secondary. The gate to the right sometimes sticks and is slow to come down. Not exactly sure of the date. 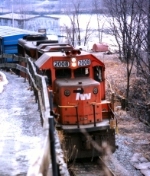 Description: PR-2 coming out of the Valley Yard onto the East Providence Secondary to do the days work. Not exactly sure of the date. Title: Isn't it cute! It thinks it's an ALCo. Description: PW 2008 smoking it up as it shoves a cut of gondola cars in the Valley Falls Yard as it makes up PR-2. Description: PW 2008 clearing Titus Street as it makes up PR-2. Description: Providence and Worcester train PR2 on the (East Providence) Pawtucket Industrial Highway. Their at the old Darlington Yards and John's getting ready to swing down and flag the crossing. Description: Mechanical Department personnel working on the problem of a bad bulb. Its 7:30, and with the hot and humid weather we've been having, Brian's already cooking in the cab!